The 2010 World Record Mission for longest underwater stay by a team of aquanauts has already begun in the field. 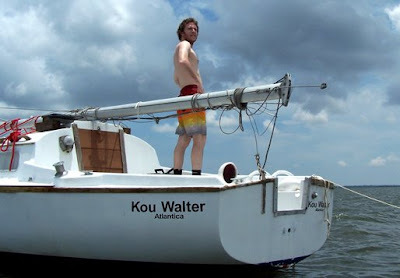 Shown here is a photo taken earlier today of Atlantica Mission crewmember Brett English onboard the Kou Walter near Polaris B – the proposed site of the underwater mission. A three member team went out to investigate several key logistic elements of the mission. 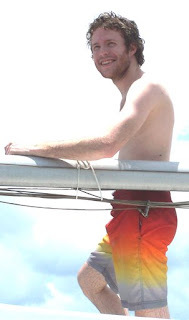 Because of the extensive mission requirements that will see three crewmembers stay down for uninterrupted stays of months duration as well as a full time surface crew and a chain of more than 50 different aquanauts visiting the Leviathan and New Worlds Explorer habitats on a daily basis, the logistics chain has to be well planned. We are already setting it up as shown in this photo in a step wise fashion that requires miles of in water support. The nearest boat ramp to the location is some five miles distant. Over this distance and two staging points separated by more than 13 miles of water, a constant stream of crewmembers, supplies, fuel, food, water and scientific instruments must be safely traversed. This is why the work has already begun, even though the mission start date is still 781 days away! Brett English is not only an accomplished diver, he is also the artist responsible for the modeling of the habitats New Worlds Explorer and Leviathan. He is a resident of Orlando, Florida and a graduate of Full Sail University. Moon trip for only $10,000 !